The Barn provides spacious first floor self catering accommodation in an impressive and artistic conversion of one of the oldest cottages in the village. Access to the apartment is via an oak staircase leading onto a balcony which leads into a large comfortable lounge. A fully equipped kitchen with induction hob, electric fan oven, fridge and washing machine are available for your use together with a microwave oven. The large TV, DVD player and CD player are situated in the lounge together with ample, comfortable seating. Off the internal hallway is a spacious double bedroom with a King Sized bed and views across the open countryside. A separate bathroom (with over bath shower) also leads off the internal hallway. Full central heating ensures a warm and cosy feeling even in the depths of winter. Towels and bed linen are provided. There are plenty of storage facilities for clothes and the kitchen comes equipped with all the crockery and cutlery you may need should you choose to cook. The balcony is furnished with a table and two chairs and is a perfect suntrap for you to relax and enjoy a glass of wine or a refreshing cup of tea. The Barn @ The Old Bakery is owned by Ken and Carol, who live at The Old Bakery. Youlgrave is a really friendly village. Everyone speaks to each other and are always happy to 'pass the time of day'. There are 3 pubs in the village all serving great home cooked food. There are 3 shops selling between them all you need to enjoy your stay. Youlgrave is situated in the heart of the Peak District National Park. The area is one of outstanding natural beauty with walking from the property. The bathroom is situated in the hallway between the bedroom and lounge. There is a bath, handbasin and toilet. There is a shower over the bath. Hand towels and toilet tissue is provided for the duration of your stay. All linen is provided for the duration of the stay. Internet is provided for guest use during their stay. Induction Hob ( 4 rings) with a complete range of induction compatible pans. A double toaster is provided. There is a selection of books in the bedroom for the benefit of guests during their stay. We operate a borrow and replace book library scheme. The Barn @ The Old Balcony has a balcony at the top of the 13 oak steps. It contains two chairs and a small table. The balcony is south facing and receives the sun all day. A great place to relax. Secure Bicycle storage can be arranged. Carsington Water, 20 minutes drive away, offers sailing and kayak / canoeing instruction and facilities for the use of private hire. The Barn @ The Old Bakery is accessed via 13 oak steps, and as such is unsuitable for wheel chair access. Ken and Carol are always available to advice about where to visit, walk or eat in the local area. A well cared for property, comfortable and with everything we could have wanted for our stay. We stayed just for three nights and it was perfect and very relaxing. Bedding and towels were very high quality with everything coordinated, it was a joy. We loved the little outside space and enjoyed sitting there. The entrance was difficult to manoeuvre and parking was tight, but it did not detract from the appeal of the cottage. Overall a very enjoyable stay would certainly consider booking again if we are coming to Derbyshire. Youlgreave is a village in the White Peak where the rolling hills of the Derbyshire Dales are seen from every aspect of the village and the River Bradford runs through the valley above which the village nestles. 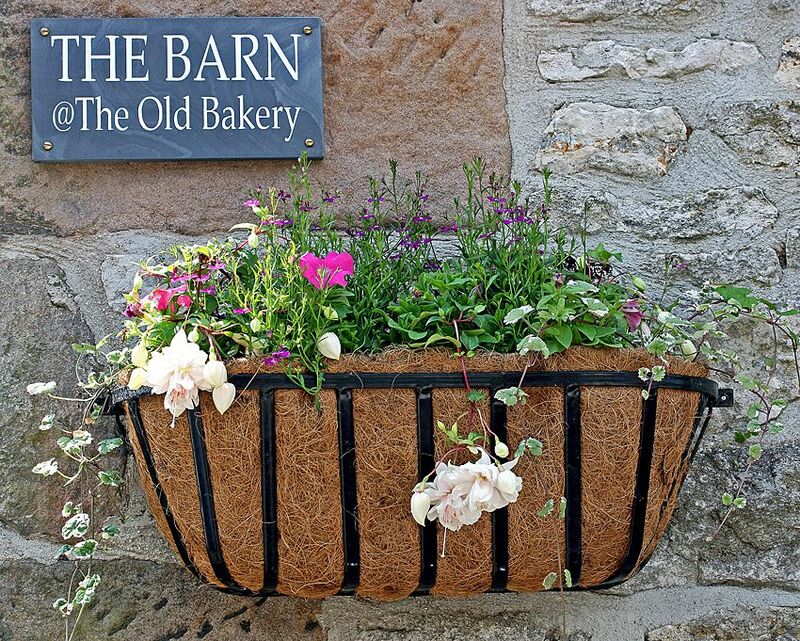 The Barn @ The Old Bakery is to be found in the centre of the village. Next door is the Butcher's shop and within walking distance are the three village pubs so you are never far from provisions or excellently kept beers and home cooked food. Walking from The Barn you can easily access the River Bradford and from here stroll along to the equally beautiful River Lathkil or for more determined walkers there are many more demanding walks all starting from The Barn. Cyclists can also take long or short, easy or more demanding routes from The Barn or travel the short distance to Bakewell to cycle along the Monsal Trail which follows the disused railway line to Buxton. Youlgreave/Youlgrave is a historical centre, a village built from the lead mining industry of the nineteenth century but also close by is the Neolithic henge of Arbor Low. Chatsworth House and Haddon Hall are within walking distance or a very short drive. The Barn @ The Old Bakery can be used as a base for walking, cycling, sightseeing or of course relaxing and recharging the batteries. There is much to see and do, many places to explore and with the stunning countryside and 'off the beaten track villages', a new jewel can be found around every bend. Many people return each year to re-acquaint themselves with the village, the countryside and their favourite places. One poorly kept secret is the friendliness of the people in Derbyshire and Youlgrave people are no exception, as you will discover.